UPDATE: The Bellator 206 results are in and Gegard Mousasi ran through Rory MacDonald in the main event. Tonight (Sept. 29) the Bellator 206 results will roll out live. The event will be held inside the SAP Center in San Jose, Californa. 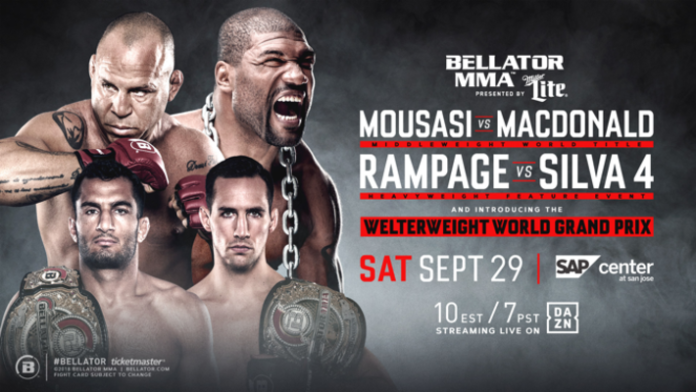 In the main event of Bellator 206 (see predictions here), middleweight champion Gegard Mousasi will put his title on the line against welterweight title holder Rory MacDonald. The co-main event will feature the fourth bout between Quinton “Rampage” Jackson and Wanderlei Silva. A Welterweight Grand Prix bout between Douglas Lima and Andrey Koreshkov will also be featured on the main card of Bellator 206. Yesterday, the Bellator 206 weigh-ins took place. All main card fighters made weight. Getting the main card started will be a featherweight bout between Gaston Bolanos and Ysidro Gutierrez. Aaron Pico will also appear on the main card, taking on Leandro Higo. The prelims should provide some solid action. Adam Piccolotti will go one-on-one with James Terry. This bout will be at a catchweight of 160 pounds. You can peep the live prelim stream above starting at 8 p.m. ET. Keep refreshing the page for live result updates. Bellator often doesn’t air one or two preliminary bouts, but sometimes they will return to the live feed for some post-main card action.